The Alibaba IPO is not only the biggest of this week's upcoming IPOs, it could be the largest initial public offering ever. 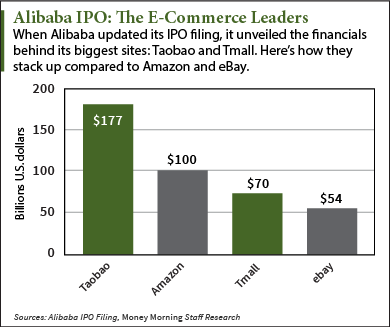 According to a new report today, the Alibaba IPO price is expected to reach as high as $70 per share. Originally, the company had set a price range of $60 to $66 per share, which could have brought in a whopping $21.1 billion. The company has also stated that the total could climb as high as $24.3 billion depending on how many shares the company's underwriters buy after the deal. Currently, the title for largest IPO ever belongs to the Agricultural Bank of China Ltd., which raised $22 billion in 2010. Alibaba Group Holding Ltd. (NYSE: BABA) is the largest e-commerce company in China, which is the largest e-commerce market in the world. In 2013, Alibaba's most popular site, Taobao, handled $177 billion in transactions. Approximately $70 billion exchanged hands over Alibaba's second-largest site, Tmall, during the same time. That compares to Amazon.com Inc.'s (Nasdaq: AMZN) $100 million and eBay Inc.'s (Nasdaq: EBAY) $54 billion in the same time period. Last quarter, the company reported revenue of $2.54 billion, a 46% increase from the previous year. At the same time, the company had earnings of $1.99 billion. Taobao reported a gross merchandise volume increase of 33% year over year, while Tmall's was up 81%. But it's not just an online shopping company. Alibaba is also engaged in cloud-computing, Internet search, pay-TV, payment services, video games, digital media, logistics, online real estate, and brick-and-mortar retail. When BABA stock begins trading on the NYSE, the company expects to have a market valuation of $155 billion. That could easily surge as high as $200 billion following the initial public offering. The final Alibaba IPO price will be announced on the evening of Thursday, Sept. 18, and Alibaba stock will begin trading on the NYSE on the morning of Friday, Sept. 19. Civitas Solutions Inc. (NYSE: CIVI) is the second-largest IPO this week as the company looks to raise $252 million by selling 11.7 million shares at a range of $20 to $23. Civitas is a provider of home- and community-based health care to individuals with developmental disabilities. Following the IPO, CIVI is expected to have a market value of approximately $805 million. CIVI stock will hit the market on Wednesday, Sept. 17. Tokai Pharmaceuticals Inc. (Nasdaq: TKAI) is a biotech firm that works with small-molecule therapies used to treat prostate cancer. Through its IPO, TKAI is expected to raise $76 million by offering 5.4 million shares at a range of $13 to $15. Following the deal, TKAI should have a market cap of roughly $310 million. TKAI stock will begin trading on the Nasdaq on Wednesday, Sept. 17.